I'll be speaking and answering questions at the Westport Library at 10:30 am Saturday, Jan. 7, 2017. There's no admission charge. While she’s watching the crew build the Winter Carnival ice palace, Troy Chance sees a body encased in the frozen lake—a man she recognizes as the boyfriend of one of her roommates. Assigned to write a feature on his life and mysterious death, Troy discovers he was the missing son of a wealthy Connecticut family. Trying to unravel what brought him to this Adirondack village to work odd jobs, she joins forces with his girlfriend and his sister, who comes to town to find answers—and as Troy digs deeper, it’s clear someone doesn’t want the investigation to continue. When she uncovers long-buried secrets that could shatter the serenity of the small town and many people’s lives, she’ll be forced to decide how far her own loyalties reach. On sale on Amazon and all ebook retailers. Anthony-learning LEARNING TO SWIM is on sale in all e-bookformats! Here's Taylor's, on sale until July 5: BookBub (all sale sites listed). Enjoy! Heading up to Middlebury, where I'll be hand-selling some of my favorite books at The Vermont Book Shop from 1-3 pm as part of Indies First - Small Business Saturday. Hope to see some of you there: 380 Main St., 802-388-2061. GLORY O’BRIEN’S HISTORY OF THE WORLD – A.S. King. I think her best book since VERA DIETZ. Young adult; this author has won tons of awards. THE DOG LIVED (AND SO WILL I) – Teresa J. Rhyne. This is memoir, the story of a woman whose dog got cancer (and survived) – shortly followed by her own cancer diagnosis. Funny, heartwarming, informative, and just had a new printing. There’s a sequel just out, THE DOGS WERE RESCUED (AND SO WAS I), which delves into beagles used for testing cosmetics (the Beagle Freedom Project) and the author ultimately seeking out a more compassionate lifestyle toward all animals. MEMOIRS OF AN IMAGINARY FRIEND – Matthew Dicks. Didn’t expect to like this book from the description but could not put it down. Loved it. Quirky, immensely powerful. THE KILLER NEXT DOOR – Alex Marwood. A psychological thriller with lovely character development and a wonderful case of characters – she won the Edgar for her first crime novel last year, THE WICKED GIRLS (also most excellent). SOMEONE ELSE’S LOVE STORY – Joshilyn Jackson. Loved it. I’ve quite liked others of her books, but this one grabbed and wouldn’t let go in a particular way. STATION ELEVEN – Emily St. John Mandel. Unless you think this one has been sold to death already! WANT NOT – Jonathan Miles. I can’t normally read books that switch back and forth between viewpoints, but this one flows, smoothly and powerfully. I'm copying my friend (the immensely talented) Chris Holm here and posting my guide to where-I'll-be at Bouchercon in Long Beach this week - but not calling it the stalking guide as he did! I will also often be in the book room, the hospitality room, anywhere free food is, and of course hanging out in the bar area with everyone else in the evenings. Interviewing/haranguing Catherine Lea of New Zealand, author of THE CANDIDATE'S DAUGHTER, at her author focus session. Anthony Award presentation. Terrace Theater Lobby - Of course I'll be here, as I'm up for the best novel award! Best novel nominees: Robert Crais, Julia Spencer-Fleming, Sara J. Henry, William Kent Krueger, Hank Phillippi Ryan. All nominees listed here. 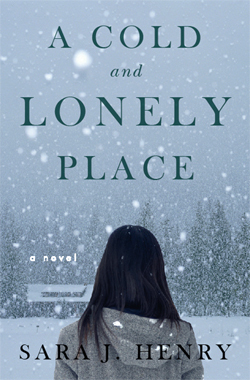 Crown Publishers has just put my Anthony-nominated second novel, A COLD AND LONELY PLACE, on sale on all e-book platforms, for the first time. So if you want to read it - or would like to gift a friend an e-copy or just let them know about this book - now's the time. And if you've enjoyed this book, please spread the word! Thanks. Sara will be interviewing/tormenting Catherine Lea of New Zealand, author of THE CANDIDATE'S DAUGHTER, at her author focus session. Best novel nominees: Robert Crais, Julia Spencer-Fleming, Sara J. Henry, William Kent Krueger, Hank Phillippi Ryan. Nominees in other categories listed here. 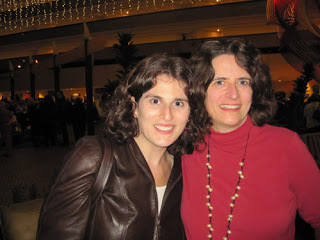 My first real Bouchercon - the huge mystery fan conference - was 2008. I didn't yet have a novel out and didn't know anyone, but found people astoundingly friendly and loved the whole experience. It wasn't until toward the end of the conference that I found out that some people had thought I was someone else altogether. But it was a great introduction to an event that I've attended every year since - and these days almost no one mistakes me for someone else. This year Bouchercon is in Long Beach, California, Nov. 13-16 - and it's not too late to register. 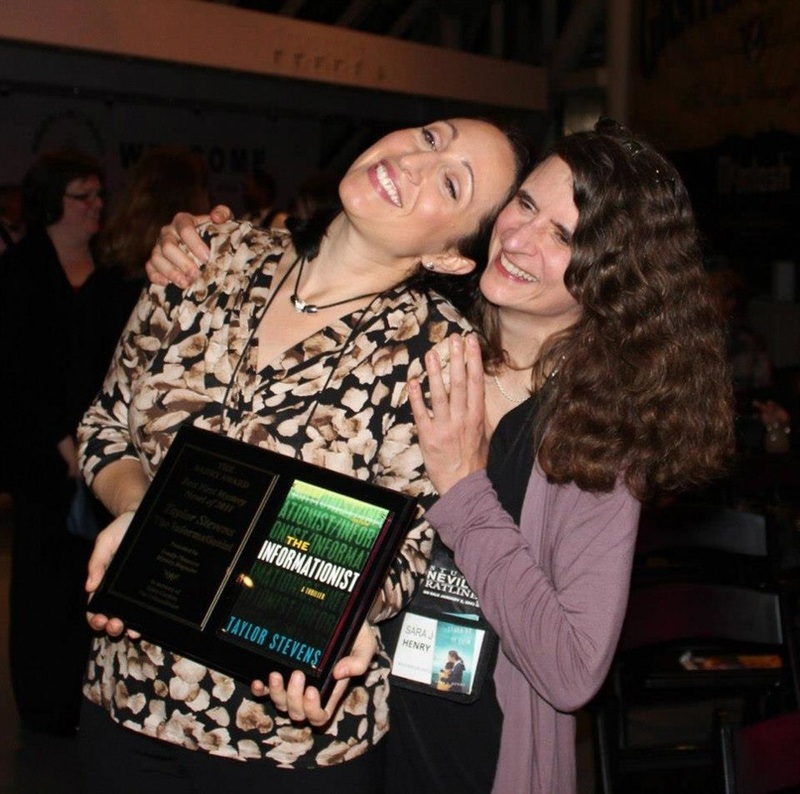 And yes, the other Sara(h), now my friend - Sarah Weinman - will also be there (and in a quirk of fate, we are both up for Anthony awards!). It is the second day of Bouchercon, the huge mystery convention. Today everyone is extraordinarily friendly, smiling at me as I pass, chatting with me between seminars and at those relatively awkward social gatherings where fans cluster together and the authors and their agents and editors are on the other side of the divide, with one tier for those who are famous and another tier for those who are not. But today I have somehow mysteriously leapt that divide. As the day progresses more and more people are smiling and nodding at me and saying hello. When I enter the pub party, with a writer I've met at another buffet line (most of my meetings seem to be food-related), I hear "Hello, Sara," but when I turn don't see anyone I recognize. During the evening one woman insists she has met me, and because it seems it would be quite rude to tell her she is wrong, especially as this would involve shouting over the din, I don't. It isn't until the next day that Special Agent Writer Guy breaks the news to me that they all think I am Sarah Weinman, a writer who reviews and blogs about books and who has been on a panel here. PI Writer Guy now begins to address me as Sara Who Is Not Sarah Weinman. For the rest of the weekend I am famous for not being Sarah Weinman - except for those who still think I am her. And note: This year Sarah and I will be on a panel together! I got the word last week that my cousin Rob's wife Casey had just been diagnosed with breast cancer, at age 33. They have two kids, 6 and 2 1/2; Casey is a nurse practitioner and Rob is an EMT. She's just had her preliminary appointments and will start chemo next week, then surgery. I knew that their budget all too soon wouldn't stretch to cover medical and other expenses, so asked if I could set up a fundraiser for them. And then I thought it would be nice to offer an incentive to thank people for donating. So - as long as supplies last - for anyone who donates at least $18, I will mail a hardcover, signed copy of my novel A COLD AND LONELY PLACE. If you'd like to do this, just click "Give Now" up above and then send me a note telling me you donated, that you'd like the book and where you'd like it sent, and if you'd like the signature personalized. FYI, all funds donated go directly into Rob and Casey's account, minus the small percentage PayPal charges if you use a credit card (note: you don't have to have PayPal to donate). And no donation is too small - little bits add up, and all is appreciated. 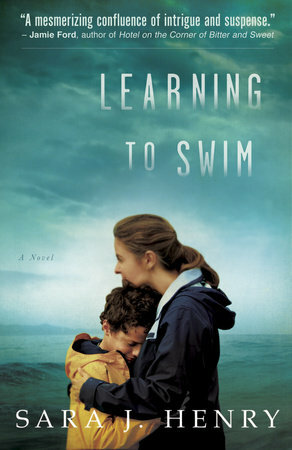 Sara J. Henry is the author of LEARNING TO SWIM and A COLD AND LONELY PLACE, and used to write health books and articles. She lives in Vermont on a dirt road with at least one too many dogs.